(Gun Save Life) – Guns Save Life is encouraging its members to sign up for a Curios and Relics Federal Firearms License. Unlike the retail gun dealer federal licenses, the C&R license is easy and inexpensive to get and it doesn’t have nearly the regulations associated with it! Why should you sign up for a C&R license? It offers access to fine, usually used firearms at wholesale prices through distributors without going through a traditional retail dealer, and the guns are shipped directly to your door. There’s also special opportunities available only to FFL holders and dealers as well. Many C&R dealers refer to themselves as “Crufflers” and really and truly enjoy the ability to acquire historical firearms at bargain prices without the hassle of buying from traditional dealers. Are you eligible? If you have a FOID card and are at least 21-years-old then you probably qualify. How do you apply? It’s easy. Visit the BATF website and review the Frequently Asked Questions which will give you an overview of which guns are covered and the basics you’ll need to know, which aren’t many. There’s a link from there to the forms which you can fill out online then print out or you can print and then fill out by hand. It’s kind of analogous to a Form 4473 that you fill out when you buy a gun from a retail dealer. You’ll submit one copy to the BATF with $30 for a three-year license and a second copy to your chief law enforcement officer (police chief or sheriff, depending on your locale). Four to six weeks later, you should have your license back from BATF. At that point, you’ll make copies and put the unsigned original in a safe place and use copies, hand-signed, when you make a purchase. 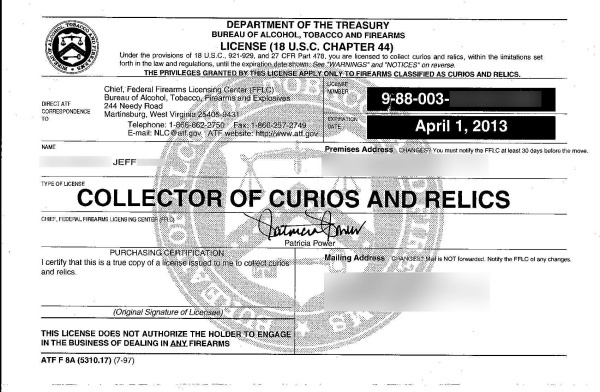 You’ll need to keep a bound book record of firearms purchased with your C&R license and later sold (there are some restrictions about selling your C&R obtained guns – this isn’t a license to conduct commerce in guns), as applicable. This entry was posted on November 30, 2012 at 6:00 am and is filed under GunNews. You can follow any responses to this entry through the RSS 2.0 feed. What are some of the details on benefits of getting this license v handing over personal information and getting on the, keep track of ’em list, including those outside of IL and subject to the FOID card? There are all sorts of FAQs at the ATF website. In short, unless there’s a problem, ATF won’t show up at your door and ask to poke around your place for an “inspection”. Basically, you’re supposed to keep a list of the C&R firearms you acquire and keep track of their disposition if you elect to sell them out of your “collection”, much as Illinois law currently requires of all Illinois gun owners. The benefits of the C&R are many, in that you can pick up C&R guns, without background checks or waiting periods, anywhere in the nation. So if you’re at the Indy 1500 or Tulsa and find a C&R rifle or pistol you want, pay the man, give him a signed copy of your license and you’re good to go. Personal info to get the license? Very much akin to the FOID card application. I will pass. I don’t want any more gov’t keeping track of everything I do. Federal, state, and local gov’ts already keep tabs on too much of my personal business as it is. Trust me, if you have a FOID card and bought a gun, you’re already ‘on the list’. I got my C&R something like 10 years ago. Never had the slightest problem with it. I originally got it to buy all the various surplus firearms that were flooding the market back then. I got a couple of Swiss K-31’s, lots of Mosins, various Mausers, etc. Even an Argentinian 1911 (Sistema). There aren’t nearly as many good surplus firearms deals now but… the other good thing is that many mail order places will treat your C&R as a dealer FFL. You send them a signed copy and they give you dealer prices. MidwayUSA, Graf’s, Brownell’s, etc. The C&R costs you $30 every three years. I save that much money ordering stuff every three months!